It’s been some time since I’ve poked my head and tried to write something technical online, in December I gave a walkthrough of a CTF VM that I developed for a local CTF. I didn’t fully finish the walkthrough (theres a lot!). In this part, the technical challenges start to spice up, involving knowledge in data type overflows in PHP and reverse engineering Linux ELF files. 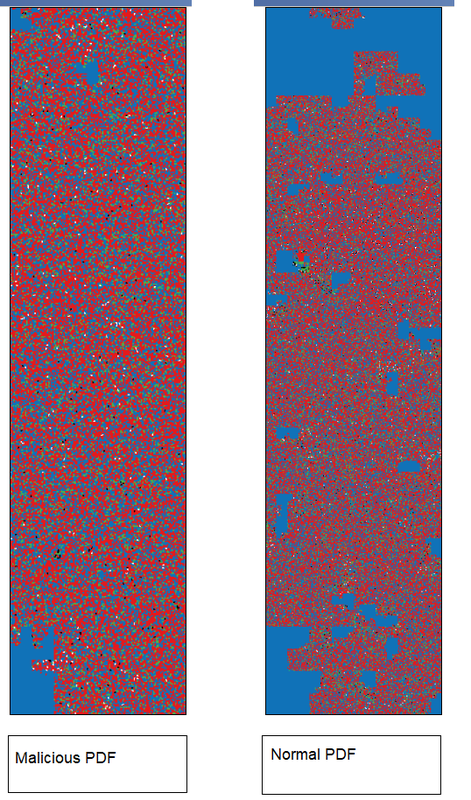 I really enjoyed making this challenge, although sometimes I feel I made it a little too abstract, especially with the integer overflows and login flags, but never the less, it was a learning experience! I apologise to anyone who can’t follow my writing, I’m not the greatest writer. I left the last post which you can find here where we were on a login screen, it looks a bit like a famous web shell, at least, the theme on the web response does, perhaps not the functionality. 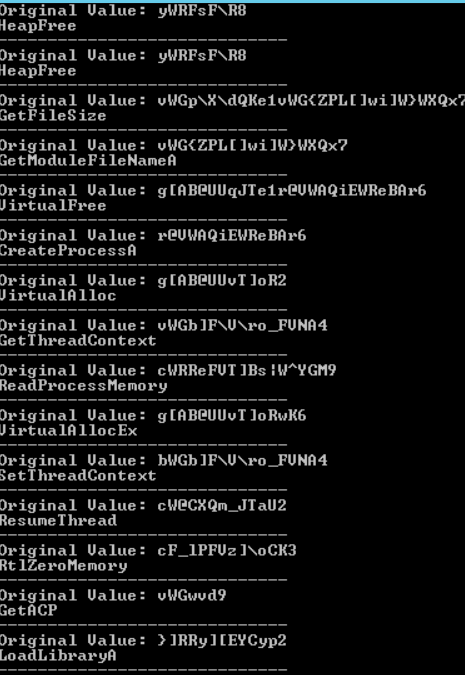 I recently made a VM for students at a CTF in London, sadly some reportedly used hex editors to get some flag values, it’s a shame for them that they couldn’t find the last two flags because they involved reverse engineering. I decided to release this to the public before the event, but let the event run before releasing to ensure no one got ahead. There are a load of different challenges aimed to make the most intelligent student question wtf is going on. This VM was intended to be one of the harder ones compared to other virtual machines available to students. I made this VM in my free time and am a bit busy at the moment, I apologise for any errors or if anything is broken! Note: I’ve wrote this in the evening, there will be errors. One of the far more simpler techniques I’ve seen from malware as of recently, many from Hackforums would do something like this in .NET language, but seems to still be slightly effective with AV detection (although, when I analysed it the detection rate was very high). The particular variant to come out of this unpacking was ‘Shade Ransomware’, which has been a prominent strand from around 2014. 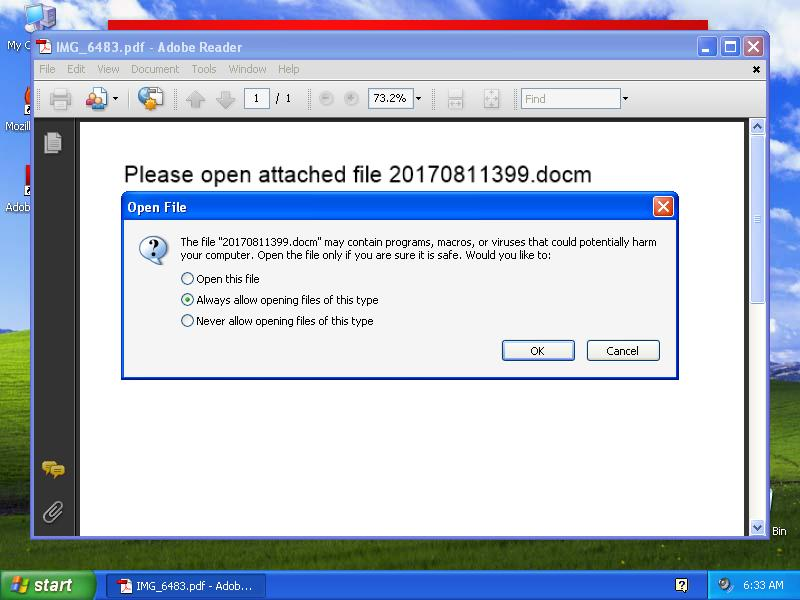 Shade ransomware is spread like many other ransomware through email attachments and exploiting vulnerabilities from a clients machine. When a user is infected, you will see your desktop background replaced with a set of instructions. These are in what I assume are in Russian and English. You will provided a unique identifier for which you must send to an email address to be able to recieve help for decryption of your important files. The actual ransomware will not be analysed in this post, although possibly a follow up post will show us more about the ransomware internals. 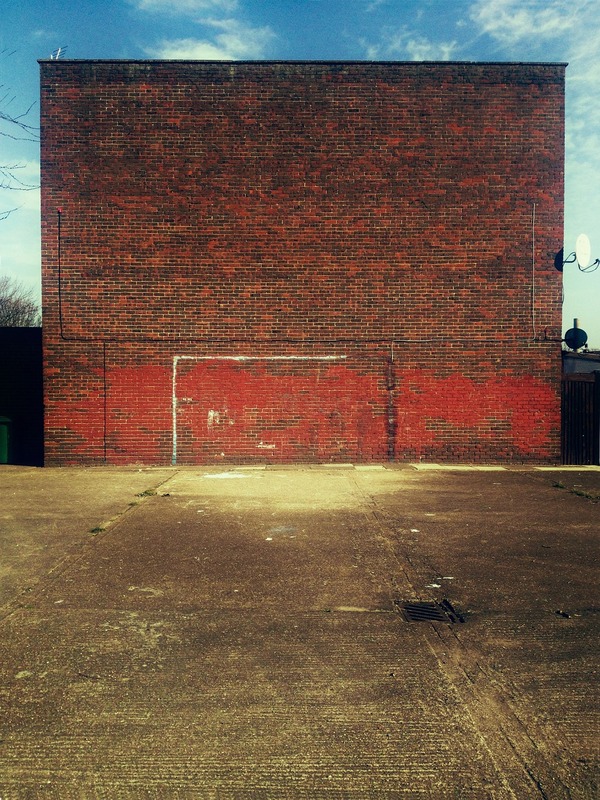 For this post, I am concentrating on the intial infection, in how it unpacks rather easily. The hashes and links to analysis will be available at the bottom of the blog post. Since Mirai, security researchers and the telecoms industry have become far more aware of the security risks that routers produce, especially from ones with poor security. Mirai highlighted how incompetency had led to mass infections around the world which allowed individuals with limited knowledge in computing to carry out devistating attacks on corporations/governments and most importantly complete countries. Well, it seems that routers can still help malware, but in a different way. Although security considerations are taken into account in modern household routers, they can still be utilised to identify an individual. This security issue also led me to think about how dangerous it can be to actually stay connected to your home network, to which you rely on your router to not identify you from your client. Many considerations are taken on the client aspect of a network, your own PC. Many privacy advocates would say the best way to stay safe would be to install tails, all traffic through TOR by first connecting to a VPN. But little is talked about the first step of getting actually online and the security issues that may occur if not correctly setup from there. Custom router firmware is around, but very few use it, instead we rely on telecoms to keep our gateway to the internet safe. Spoofing your MAC address is something else that many practice when carrying out nefarious behaviour, but without a custom piece of firmware, your router will always show it’s own MAC address when requested correctly. So why is it so interesting that a household router leaks information without authentication? It is true that logins could be intercepted by malware, but not many people login to their router interface often and so you could be waiting a long time. The information that is leaked in this particular household router, a TALKTALK one, allows malware to do far less calls than it needs to. Many pieces of malware will search for an external IP address by using a HTTP request to a ‘what is my ip address’ type site, reading the response which could be inaccurate and from a VPN or proxy. 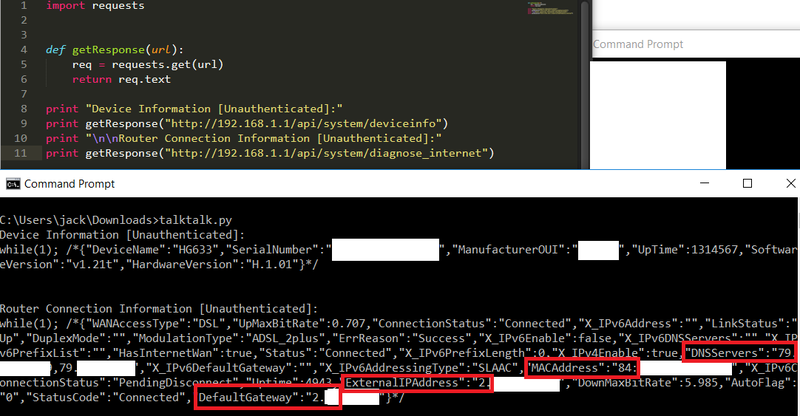 With one HTTP request (ofcourse, assuming that the infected client has this particular router firmware) we can understand their external IP address, DNS servers used on the router, the MAC address of the router and the routers default gateway. We can also learn some less important things like the SSID of the router, but, the most important ones are things we can uniquely identify a user from, even when they have installed such strong protections on their computer. The one caveat to this is ofcourse, the actual attack vector is fairly small, although TalkTalk is a large ISP in the UK, a targeted attack would only really gain from this. Either way, to me, it is bad privacy design. So with all that talk, let’s give you a picture of me showing you information that can be retrieved unauthenticated. Don’t worry just about your PC, worry about your the security on your router and how they give out information. I was recently browsing on Hybrid Analysis and decided to take poke at this sample, what made me interested in it was the call of “certutil.exe”. I was browsing the various subroutines when I find a fairly long subroutine which had some obvious indicators to deobfuscating strings, the repeated use of a ‘key’ was one clue I saw. I call this a ‘banker’ as I used that as a search term from Hyrbid Analysis, I have yet to confirm this is used to target a user logging into a bank. We could use dynamic analysis to figure out every single string but this would be laborious in logging every return compared to copying the string table and working from there. 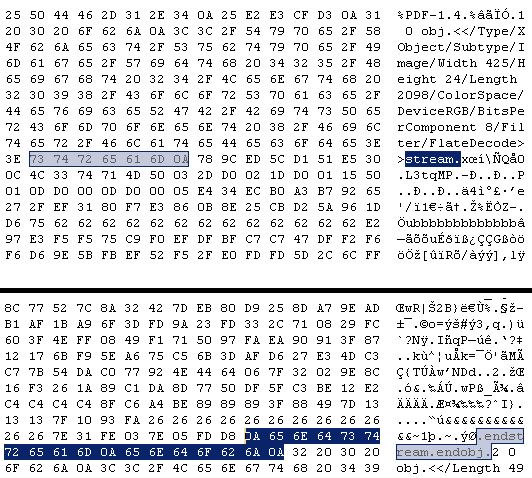 The sample also seems to have various anti-analysis techniques implemented within it, although not in this case, it can sometimes be best to compartmentalise and be realistic about what is the best option in getting information on the sample. We push four arguements to our calls, these are the length of the input string we wish to deobfuscate, the input string offset, the length of the key and the offset to our key. I’m using key loosely because the individual characters are used as a key, key pool would be more an appropriate term. 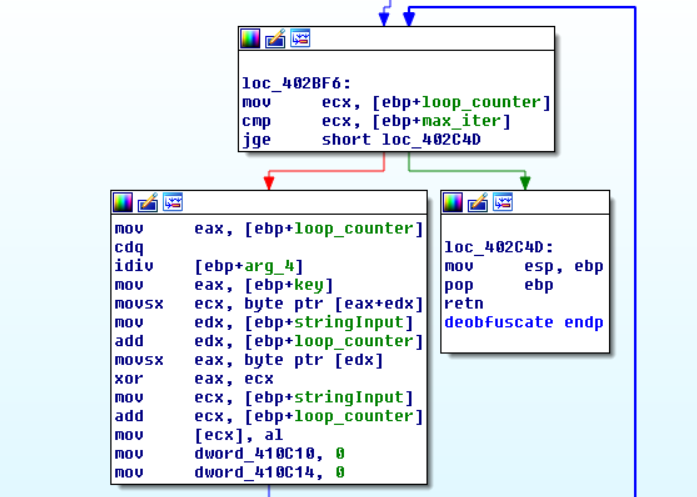 It is fairly small function which sometimes isn’t the case with malware, it is an obvious for loop as we are looping and producing a comparison in the early stages to check whether the length of our inputString has been reached or not. We set a char pointer for one of our characters in the key pool, dependent on EDX and iterate through these by the length of the key string. It is modulated in every iteration, which is fairly common in cryptographic algorithms, so that it wraps back around to potentially have any length of input. We also get a single character from our input string in preperation for the main operation, every character from our input string is treated seperately and has its own iteration. We then use a famous XOR operation to manipulate the value that we return. Quite common to see this used in malware samples and is fairly trivial to rewrite code to deobfuscate such strings, but we have an interesting choice from the developers in which most of the strings also include complete junk which we do not want to return when deobfuscating our string, this may be used to defeat automatic methods of malware detection. By XOR’ing the values with the initial string, you will get exceptions to the code. The string has every number from 1-9 but we need to also include 0 when we try to reproduce our string deobfuscation as well due to modulation, this is something static analysis may not of clocked. If we print our strings without exception handling we get results like this. The actual subroutine where this all gets called from is rather wasteful, instead of implementing some sort of loop towards an array of these strings we are instead presented with a long branch of code which repeatedly calls the same function with a seperate input string. This leads to IDA having a very scary looking function, but in fact, is very simplistic, and could be shortened considerably. I have decided to use Python as I am very comfortable with it at the moment and the script I produce can be implemented into an IDA script. Reproducing the values that IDA had provided, appending the 0, and ensuring when we hit an exception to return the string, the deobfuscation worked. I confirmed that the deobfuscation worked with strings that had hit an exception by live debugging the sample and replacing the origin of the EIP. Here I was able to give a comparison of the compared results in which I saw the junk characters were ignored. The finished result was produced by copying all the string table lines into a text file, removing parts of it that were not relevant and then feeding this by reading it from the Python script. The end result was sucessful. I notified the WordPress Team upon a non-critical cryptographic flaw in their multi-site feature which can provide an attacker a vector for impersonation in certain special circumstances. It sounds like a very good vulnerability when I state impersonation but it’s non-critical, I will explain further in the article. WordPress multi-site allows you to take manage multiple blogs (with different domains) in one place. This can be attractive to businesses with multiple installations of wordpress, it can also segment multiple teams that you may be managing which is helpful. The vulnerability was reported on 26th September in which they replied on the 28th. 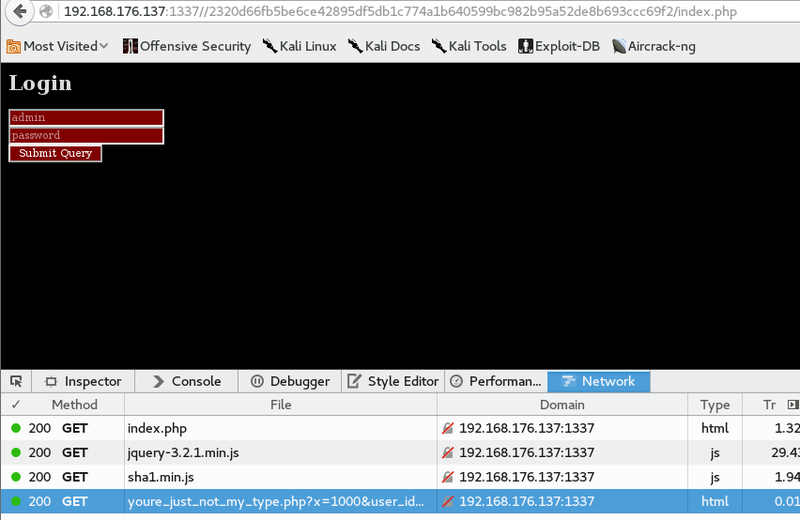 This research was for my job at insinia in which I was looking at possible attack vectors in a default installation of WordPress. I discovered many things on WordPress but have decided first to simply talk about the flaw that I found for simplicity and making things less cluttered.